We launched the online Sabres Suggestion Box on Monday, February 28, 2011 as part of our more focused effort to help the organization improve its overall performance and strengthen its relationship with fans. Nearly 1,500 responses were received during the first week. 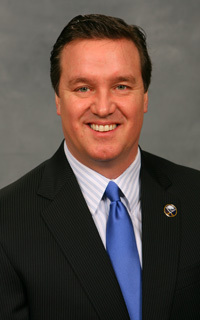 On behalf of the Buffalo Sabres I want to thank all of those who contributed their ideas to the Suggestion Box. Please know that I have read every one of the suggestions and am appreciative of the time and thought behind them. I have discussed your comments with our management team and Terry and Kim Pegula. In this, the first installment of “Opening the Suggestion Box,” the Sabres department heads will respond to several of the most common recommendations that you were so kind to share with us. Thanks again for sharing your thoughts with us...and let’s go Sabres! It would be nice to have a system that would let fans know how much time was left prior to the start of each period so they could return to their seats and not miss any of the game action. Starting with our game on Sunday, there will be an intermission countdown clock displayed in the corner of many of the concourse television monitors so fans are aware of how much time is remaining before the next period starts. In addition, we are investigating a two-minute warning to signal that the intermission is nearly over with an audio alert (horn/siren/chimes) for those who may not be near a television and are hopeful to have this operational later this season. Please change the color of the red wall that circles the top of the 100 level in the seating bowl. It would be nice to see something more consistent with the Sabres colors. That wall will be painted a different color in the off-season. Alternative paint colors are currently being considered, but due to the upcoming schedule of home games, and other arena events, the project will not be completed until the off-season. What is the situation with MSG and Dish Network? Can you please do something to help get the Sabres games back on? We are as equally disappointed with this situation as are our fans. Unfortunately, this is a matter between MSG and DISH Network, and the Sabres have no involvement in the negotiations between the two parties. As a result, we encourage all of our fans who have DISH Network to switch carriers. DISH subscribers can call 1-877-616-4MSG or visit www.iwantmsg.com for more information, including a list of other providers in their area that carry MSG and MSG Plus. With the Sabres returning to their original logo when can we expect to see all of the “Slug” logos removed from the arena? That will happen. While it won’t be possible to remove each “slug” from the arena immediately, they will be phased out as quickly as possible. Like the red wall in the seating bowl, there are some features of the Arena, such as the scoreboard, that cannot be altered or removed until the off-season because of time and access constraints. However, we will revert to our traditional logo and be “slug free” prior to the start of next season. The Sabres used to do a game program for each game...please bring it back. Starting with Sunday’s game against Ottawa, the Sabres will distribute “Game Night”, a free game program available to all fans in attendance for each remaining home game this season. This 24 page full-color program will be distributed to fans as they enter the building and will include team rosters, game notes, historical photos, feature stories and more. During the off-season we are going to revisit whether we will keep the “Game Night” format or consider other platforms or program handouts for fans. Would it be possible to play new or different music from game to game? While musical tastes vary from person to person, the Sabres will make an even greater effort to play songs from a variety of genres. In addition, Sabres.com will begin accepting musical suggestions from fans in the near future, asking for submissions to include song title, artist, and at what point during a game you think this track would be most appropriate to play (pre-game warm-ups, following a goal, etc.). Please bring back the “Sabre Dance” as the Sabres entrance music. This signature song is still typically heard at various times during Sabres games, but many fans suggested a return to the tradition of playing the “Sabre Dance” when the team takes the ice. Beginning Sunday when the Sabres host the Senators, the song will be played when the team takes the ice prior to the second and third periods. Also, we are going to use another version of the “Sabre Dance” in our game telecasts and retire the “Hurricane 2000” opening.